Trudeau Drive Time Travel Cup - Ultimate Cupholders - Cup holders for 5 Series and 7 Series BMW, Z4, Porsche Boxster / Porsche 911 996, Mercedes, Audi, Acura NSX and other fine cars. The ultimate cup holder / cupholder! I've sold out of the Drive Time mugs and likely won't receive more until after the holidays. I do have two very similar new mugs by Trudeau that I've not yet had a chance to add to the site. It’s basically the same cup but with a 16 oz capacity and a molded rubber grip and a caribiner clip instead of the handle. It’s a similar 16 oz mug but with a more convenient mechanism to open/close the flow. Rather than the twist mechanism in the Drive Time and Corona, it has a flip-type switch at the top of the handle that you flip forward to open and back to close which is much easier to operate one-handed. A better approach I think if you’re using it in a car. Either are available at the same cost. If you'd like to order, then please do so using the "Add to Cart" button below and then leave a note specifying which you'd prefer in the area provided when you go through the check-out process. I also have the OXO cups which have an easier to use push-button type mechanism. Again, better if you’d be using it in a car. Also, the OXO cups are vacuum sealed versus insulated and will keep things hot/cold quite a bit longer. The Trudeau "Drive Time" Mug was named Best Travel Mug by the Wall Street Journal. After trying it, I'd have to agree. Excellent! 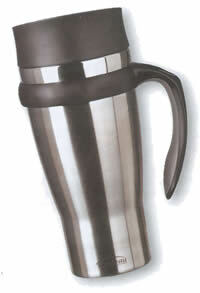 Holds 18 ounces and the double-wall insulated design with stainless steel interior keeps coffee, tea, or other drinks nice and hot (or cold) for a long time (in the WSJ test, coffee was still at 125 degrees after 3 hours). Like the cup holders, these are virtually spill proof. Employs a screw-type lid that's easy to operate and seals very securely. With the lid closed, you can literally lay these down, turn them upside down, and not a drop will drip. Opens easily and the flow is controlled with a simple twist. Has a large, easy-to-access, soft-grip handle (converts for left-handed use). The flared lip is easy to drink and pour from. All in a nice brushed stainless package (other colors also available). In fact, I liked these so much that I've arranged to make them available here at the lowest cost that you'll find anywhere on or off the Internet (sold elsewhere for $19.99 - $24.99). Note that none of the insulated stainless mugs are recommended for use in microwave or dishwasher. The caution relates to possibe damage to the seal due to expansion from the heat. That said, as long as you remove it before or wash without the heat cycle, then it should be OK. I've run mine through quite a few times and I've seen no problems. * Logo'ed versions using your graphics are available for clubs and other organizations. Please contact me for details. Copyright © 2016 by Netropy LLC. All Rights Reserved.